Not very high because I mostly stayed in Arizona this year. Includes 2 new tires each for the car and the trailer, plus a new axle for the trailer. I spent 2 1/2 months in RV parks in Mesa and Prescott when it got too hot, the rest is dry camping. This includes non-consumable supples and unaccounted-for items. The biggest item was my new TV and mounting bracket for $ 154. Fortunately, I recently got other insurance, so next year should be under $ 3,000. I had quite a bit of dental work done this year, and I refuse to have it done in Mexico. So now we're up to $ 26,046. I have not included non-RVing expenses, such as the trip to Tahiti, the trip to my son's wedding, or the trip to my father's 90th birthday party. I have also not included income tax or the cost of new vehicles (none this year) or the loss in value of my current vehicles. Another note - I am not trying to be particularly frugal. If I see something I want, I buy it. (Hence all the cameras...) But I always try to get the best deal possible. Thanks for sharing the financials ... it's always interesting to see how and where and how much others spend on the road. This is so very helpful for those of us trying to become full-timers. Thank you. Looks like you do a good job keeping expenses under control. Too bad health insurance is so expensive. Life is real. Thanks for sharing you expense. Thanks so much for posting your costs, it helps us hone our own budget. Since the high cost of health insurance is a concern for most of us, would you mind sharing what company you were with before and after, and what kind of coverage you had/have with both? Also, was the cost based on your state of "residence"? To live this life here you would have to include ferries to Europe and the fuel to drive to southern Spain as we dont have such a favourable climate in the uUK. 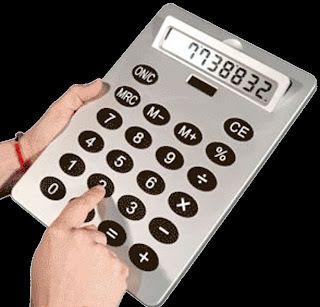 I guess the calculator, with its $7 million figure on the screen, isn't a real photo of your computation! Good job! How do you keep your groceries so low? Tara - I used to have BCBS of Florida. I have switched to BCBS of Arizona. They seem to cover more preventative stuff. I also raised the deductible, since I never go over it anyway. Zoe - I was wondering if anyone would notice that! Thanks Diane....are you using an AZ address as your residence to get a policy thru BCBS of AZ? Tara, yes, my sister has a house in Arizona. I think I'd rather have a heart attack. A Mexican dentist would charge about $2500, and have about the same rate of success as a US doc. Thanks for the financials; it helps me in my planning for next year when I go full time. Glad to see you posting again. I missed your blog over the Holidays when you were busy with family and friends. Be safe on the road. Even with my trip to the east coast this year my average daily expense for camping was only $6 and my average monthly gas expense only $350. I was really quite surprised it was so low. Belonging to all the fraternal organizations really made a difference since I rarely stayed at an RV park and the east doesn't have any BLM land. WELL its always good to know where you stand, this is a great blueprint on what one could expect. I know your background is accounting so Im sure its in your blood to keep up with every penny...I am super frugal...and some probably wouldnt even consider my lifestyle as LIVING...lol but I am always happy to look for a bargain-and head to the second hand store first. HEY what are your new cameras? ?I recall you got the waterproof video camera. Just bopped over from gumo's blog. Although I don't keep as good of track as you I still know I spend less to live a full-time lifestyle than when land based. If your looking for a nice place to park in central AZ (5000 ft) this summer I recommend Yarnell. The space on private property where I spend my winters is usually open and very reasonable. LOL With those crisp records, you can certainly tell that you have an accounting background! My partner is an EA and works for a major (the major?) accounting firm in the country. He would have records like yours too. I personally love this warm weather. It allows us to go places during the winter that we otherwise wouldn't be able to. I went to Sequoia National Forest a few weeks ago to see "The Sherman Tree". It was magnificant. he park ranger said this was the first winter since 1981 that the mountian had been open and not under 12 feet of snow. Pretty amazing year weatherwise. This question of how much does it cost to live on the road seems to get WAY to much attention. I believe that IF you spent everything you had coming in while you were in a sticks-n-bricks then you will spend everything while living on the road. Your money habits don't change much, you just spend it on different "stuff". Thanks for posting this information - I think most people would feel this is too personal. I find this information very interesting and useful! Very interesting! I'm hoping to retire in a few years and that was useful! Found your blog and started from the beginning - neat stuff. I see the club parking is so cheap. I have a friend who is a Moose member so hoping we can get membership through her. Wonder how you get into the Elks not knowing anyone? Thanks for your information. I am a recent full-timer in an Arctic Fox 22G. This Has Been the Warmest Winter Ever!